Modification in the function of dendritic cells (DC), such as that achieved by microbial stimuli or T cell help, plays a critical role in determining the quality and size of adaptive responses to Ag. NKT cells bearing an invariant TCR (iNKT cells) restricted by nonpolymorphic CD1d molecules may constitute a readily available source of help for DC. We therefore examined T cell responses to i.v. injection of soluble Ag in the presence or the absence of iNKT cell stimulation with the CD1d-binding glycolipid α-galactosylceramide (α-GalCer). Considerably enhanced CD4+ and CD8+ T cell responses were observed when α-GalCer was administered at the same time as or close to OVA injection. This enhancement was dependent on the involvement of iNKT cells and CD1d molecules and required CD40 signaling. Studies in IFN-γR−/− mice indicated that IFN-γ was not required for the adjuvant effect of α-GalCer. Consistent with this result, enhanced T cell responses were observed using OCH, an analog of α-GalCer with a truncated sphingosine chain and a reduced capacity to induce IFN-γ. Splenic DC from α-GalCer-treated animals expressed high levels of costimulatory molecules, suggesting maturation in response to iNKT cell activation. Furthermore, studies with cultured DC indicated that potentiation of T cell responses required presentation of specific peptide and α-GalCer by the same DC, implying conditioning of DC by iNKT cells. The iNKT-enhanced T cell responses resisted challenge with OVA-expressing tumors, whereas responses induced in the absence of iNKT stimulation did not. Thus, iNKT cells exert a significant influence on the efficacy of immune responses to soluble Ag by modulating DC function. A significant challenge for the immune system is to be able to distinguish between harmful and benign antigenic stimuli to avoid inappropriate adaptive responses. Evidence suggests that modification of the function of APC, specifically dendritic cells (DC),4 plays a critical role in this process (1). DC reside in peripheral tissues in an immature state defined by significant capacity for Ag uptake and low expression of MHC and costimulatory molecules. Upon exposure to inflammatory stimuli, DC undergo a maturation process involving migration to lymphoid sites, down-regulation of the rate of Ag uptake, and increases in levels of MHC and costimulatory molecules. These changes enable DC to present Ags to naive CD4+ and CD8+ T cells and thereby promote adaptive immune responses (2). The potency of DC as APC for naive T cells can also be modulated directly by microbial stimuli via pattern recognition receptors, of which Toll-like receptors are the prime examples (3), and also by signals such as CD40 ligand (CD40L) (4, 5), RANKL (6), and Fas ligand (7) mediated by T cells themselves. With respect to the latter T helper function, studies have shown that CD4+ T cells can activate DC specifically through signals mediated via CD40, inducing further up-regulation of surface molecules involved in T cell stimulation and inducing the release of IL-12 (5). This conditioning of DC is particularly important for the generation of CTL from naive CD8+ T cell precursors (8, 9, 10). However, a significant obstacle to the efficacy of help provided by T cells in this manner is the scarcity of naive T cells with reactivity to unique Ags presented by the DC. In contrast, CD1d-restricted NKT cells expressing the invariant TCR α-chain encoded by Vα14Jα281 gene segments in mice and Vα24JαQ in humans (iNKT cells) are found in relative abundance in tissues such as spleen, bone marrow, thymus, and liver (11, 12). Furthermore, although the natural ligand for such invariant TCR cells has not been defined, it is possible that iNKT cells respond to a glycolipid presented by CD1d molecules that is induced as an innate response to cellular distress. As iNKT can express CD40L and secrete significant levels of inflammatory cytokines, it is possible that these cells can be readily induced to activate DC (13). In support of this hypothesis, it has been shown in mice that stimulation of iNKT cells can enhance DC-based immunization strategies (14). Also, recent studies have shown that human NKT cell clones restricted to the group I CD1 molecules CD1a, CD1b, and CD1c, and γδ T cells restricted by CD1c can directly induce maturation of cultured DC in vitro (15, 16). Therefore, a range of CD1-restricted cells may be poised, together with direct microbial stimuli, to integrate innate immune responses with appropriate adaptive responses. Exogenous protein Ags can be taken up by APC and processed into peptides for presentation on the cell surface by MHC class II molecules to CD4+ T cells. This has been referred to as the exogenous pathway of Ag presentation. In contrast, intracellular Ags are processed and presented by MHC class I molecules to CD8+ T cells; the so-called endogenous pathway of Ag presentation (17, 18). It is now becoming clear that some APC, including subsets of DC, are capable of presenting peptides derived from exogenous Ags on MHC class I molecules, resulting in the stimulation of CD8+ T cell responses (19, 20, 21). This would be a desirable outcome for protein-based vaccine development in which CTL responses are sought. However, such cross-presentation is generally thought to be an inefficient process and in many instances has led to tolerance rather than immunity (reviewed in Refs. 1 and 22). It has been reported that the provision of T cell help can induce immunity from a previously tolerogenically cross-presented Ag (23, 24). The functional state of the cross-presenting APC is therefore pivotal to the immunological outcome to exogenous Ag. We investigated whether iNKT cells can influence immunological responses to soluble Ag by injecting mice i.v. with chicken OVA protein and α-galactosylceramide (α-GalCer), a CD1d-binding glycolipid that has been shown to specifically induce activation of iNKT cells (25). We show that, while i.v. administration of OVA protein alone can induce activation of CD4+ and CD8+ T cells, these responses can be considerably enhanced by concomitant activation of iNKT cells, leading to modulation of DC function. C57BL/6, 129S6/SvEv, and CD40L−/− mice were obtained from breeding pairs originally obtained from The Jackson Laboratory (Bar Harbor, ME). Also used were mice lacking the Jα281 TCR gene segment (26), which were devoid of Vα14+ NKT cells while having other lymphoid cell lineages intact (referred to in the text as iNKT−/− mice), CD1d−/− mice (27), and IFN-γR−/− mice (28). Cultures were maintained in complete medium (CM) comprised of RPMI (Sigma-Aldrich, Dorset, U.K.) supplemented with 2 mM glutamine, 1% penicillin-streptomycin, 5 × 10−5 M 2-ME (Invitrogen, Paisley, U.K.), and 10% FBS (Globepharm, Guildford, U.K.). Chicken OVA grade VII was purchased from Sigma-Aldrich. Chicken OVA peptides OVA257–264 (binding to H-2Kb) and OVA323–339 and OVA265–280 (both binding I-Ab), and lymphocytic choriomeningitis virus glycoprotein peptide lymphocytic choriomeningitis virus glycoprotein aa 34–41 (LCMV34–41; H-2Kb) were prepared in-house. The α-GalCer, KRN7000, was supplied by Kirin Brewery Co. (Gumna, Japan), and β-GalCer was purchased from Fluka Chemie (Basel, Switzerland). Generation of OCH, an analog of α-GalCer with a truncated sphingosine chain (29), was achieved by adopting our strategy reported for the synthesis of KRN7000 (30). The glycolipids were solubilized in 0.5% Tween/PBS, hereafter referred to as vehicle. Commercial kits for IFN-γ ELISPOT (MabTech, Nacka, Sweden), IFN-γ and IL-4 ELISA (R&D Systems, Minneapolis, MN), and DC isolation from tissue (Miltenyi Biotech, Gladbach, Germany) were used according to the manufacturers’ instructions. All mAbs used for FACS analysis were obtained from BD PharMingen (San Diego, CA). OVA protein, glycolipid solutions (α-GalCer, β-GalCer, or OCH), or vehicle were diluted in PBS before injection into the lateral tail vein. Groups of animals (n = 5) received 400 μg of protein/mouse and either 1 μg of glycolipid/mouse or an equivalent final volume of vehicle. DC were cultured from bone marrow cells in 20 ng/ml IL-4 and 20 ng/ml GM-CSF for 7 d and were loaded with Ag by incubation in CM containing 10 μM synthetic peptide for 2 h, 100 μg/ml protein for 24 h, or 100 ng/ml glycolipid for 40 h. Cells were washed to remove excess Ag before i.v. injection (6 × 105 DC/animal). Mice were infected with 106 PFU of the recombinant vaccinia virus VV-OVA (31), expressing full-length chicken OVA, by i.v. injection in PBS. Tetrameric H-2 Kb/OVA257–264 peptide complexes or tetrameric H-2 Kb/LCMV34–41 peptide complexes were prepared as outlined by Whelan et al. (32) and were used to stain PBL isolated from the lateral tail vein as described in the report by Palmowski et al. (33). Analysis of PBL from naive animals revealed background staining equivalent to that observed with irrelevant peptide/MHC tetramers (data not shown). Cytotoxicity was assessed against syngeneic spleen cell populations loaded with specific Ag administered by i.v. injection. Mixtures of four populations were injected: a control population without Ag fluorescence-labeled with the dye chloromethyl-benzoyl-aminotetramethyl-rhodamine (10 μM), and three target populations loaded with different concentrations of peptide (5 μM, 500 nM, and 50 nM) and fluorescence-labeled with CFSE at different dye concentrations (1.65, 0.3, and 0.07 nM). Ag-specific lysis was assessed by FACS analysis of blood, with the mean percent survival of peptide-loaded targets cells calculated relative to that of Ag-negative controls. Cytotoxic activity was expressed as the percent specific lysis, calculated by the equation 100 − mean percent survival of peptide-loaded targets. Animals were challenged with 1 × 106 EG7.OVA cells expressing a cDNA encoding the chicken OVA sequence (34), injected s.c. into the flank. Mice were monitored for tumor growth every 3–4 days, and tumor size for each group (n = 5) was calculated as the mean of the products of bisecting diameters (±SEM). Measurements were terminated for each group when the first animal developed a tumor >200 mm2. The possibility that iNKT cells can influence the quality of adaptive immune responses was investigated in the context of T cell priming via i.v. delivery of soluble Ag. Immune responses were monitored in C57BL/6 mice injected with chicken OVA protein in the presence or the absence of the iNKT cell ligand α-GalCer. Of particular interest was the possibility that iNKT cell-mediated signals, be they soluble factors or cognate interactions, could lead to cross-presentation of peptides derived from the administered OVA protein to peptide-specific CD8+ T cells, thereby providing potent CTL responses. For this reason, immune responses were screened in the blood using MHC class I/peptide tetramers capable of highlighting CD8+ T cells reactive to the H-2 Kb-binding peptide OVA257–264. The results of this analysis, presented in Fig. 1⇓, A and B, indicate that coadministration of OVA and α-GalCer led to a significant increase in OVA257–264-specific CD8+ T cells over that in animals given OVA and vehicle alone. Repeated experiments indicated that coadministration of α-GalCer with OVA led to 5- to 10-fold increases in OVA257–264-specific CD8+ T cells in the blood. Thus, while cross-presentation of peptides derived from OVA was observed in the absence of activation of iNKT cells, the levels of cross-presentation were markedly increased by concomitant stimulation of iNKT cell activity. Injection of soluble Ag i.v. induces functional T cell responses that are enhanced by coadministration of α-GalCer. Chicken OVA was injected into C57BL/6 mice together with either α-GalCer or vehicle. A, Induction of OVA257–264-specific CD8+ T cell responses was assessed in the blood by FACS analysis 7 d later using tetrameric H-2Kb/OVA257–264 complexes. FACS profiles of naive animals (control) and those receiving OVA with either α-GalCer or vehicle are shown, with mean percentages of tetramer+ cells of CD8+ cells (±SEM) for each treatment group charted (B). C, Cytolytic activity of the induced OVA257–264-specific response was assessed in vivo on day 13 against different CFSE-labeled syngeneic splenocytes loaded with titrated doses of OVA257–264-peptide. A splenocyte population without peptide labeled with chloromethyl-benzoyl-aminotetramethyl-rhodamine served as an internal control. Representative FACS profiles for each treatment group are shown, with the mean percent specific lysis for each treatment group charted (D). E, IFN-γ ELISPOT assays were performed on splenocytes harvested on day 11 and stimulated for 48 h in the presence of 10 μM MHC class I binding peptide OVA257–264 or class II binding peptides OVA265–290 and OVA323–339. Cytotoxic capacity of the induced CD8+ T cell responses was assessed against OVA257–264 peptide-loaded syngeneic splenocyte targets that had been labeled with fluorescent dye and injected into the lateral tail vein 13 days after initial priming with OVA with or without α-GalCer. Specific lysis of the Ag-loaded population was monitored relative to a differentially labeled control splenocyte population that was not loaded with peptide. This assay, presented in Fig. 1⇑, C and D, indicated that specific cytotoxic activity was observed in all OVA-treated animals regardless of whether α-GalCer was administered. However, where α-GalCer was used, the cytotoxic response was markedly greater, a likely reflection of the overall increase in the specific CTL pool in these animals. As a further assessment of functional activity, peptide-specific ELISPOT assays were used to assess IFN-γ production from the induced OVA257–264 CD8+ T cell population. These assays, performed on splenocytes, were in agreement with the MHC class I tetramer data from the blood, with coadministration of α-GalCer and OVA leading to increased numbers of OVA257–264-specific IFN-γ-producing cells over levels found in animals treated with OVA and vehicle. 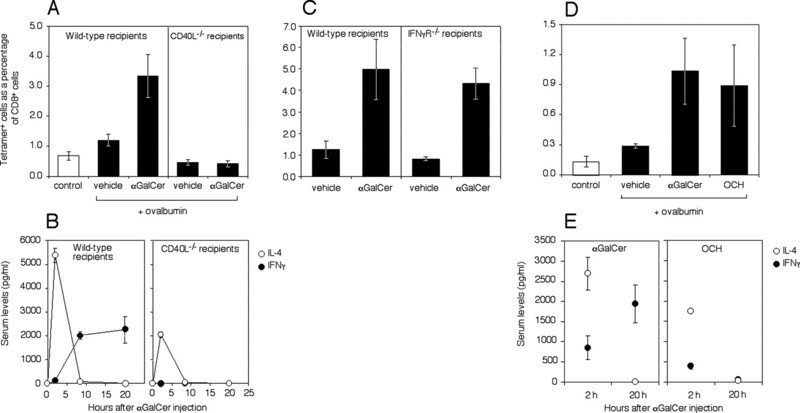 In addition, IFN-γ ELISPOT assays were used to show that responses to the MHC class II binding peptides, OVA323–339 and OVA265–280, were similarly affected by α-GalCer treatment (Fig. 1⇑E). Thus, CD4+ T cell responses are also increased by α-GalCer treatment. As a final assessment of functional activity, the ability of the induced OVA-specific T cells to respond to further stimulation in vivo was examined. Animals that had received OVA with or without α-GalCer were challenged with vaccinia encoding the whole chicken OVA DNA sequence 1 wk (Fig. 2⇓A) or 5 wk (Fig. 2⇓, B and C) after protein administration. Regardless of the timing of this restimulation regimen, OVA257–264-specific CTL populations were greatly expanded in the blood 7 days after viral challenge, with groups initially treated with OVA and α-GalCer producing the most significant restimulatory responses. OVA257–264-specific CD8+ T cells induced in the absence of α-GalCer could also be restimulated, although to a lesser degree, most likely reflecting the lower initial frequency of primed cells. Restimulation of T cells in vivo with OVA257–264 peptide-loaded DC 1 wk after protein administration produced similar results (data not shown). Injection of soluble Ag with or without αGalCer induces T cell responses with potent restimulatory capacity. OVA257–264-specific T cell responses in animals receiving i.v. injection with OVA together with either α-GalCer or vehicle were restimulated with i.v. injection of recombinant vaccinia virus encoding chicken OVA 1 wk (A) or 5 wk (B and C) after protein administration. Specific responses were assessed in the blood by FACS analysis using fluorescent tetrameric H-2Kb/OVA257–264 complexes 7 days after injection of virus. Charts showing mean responses for each treatment group (±SEM) before restimulation (left panels) and after restimulation (right panels) are presented. Control groups without prior OVA treatment served to control for the efficacy of the viral stimulus, and naive animals served as negative controls. Sample FACS profiles are shown in C.
It was still possible that the increased immune response to injection of OVA protein seen in the presence of α-GalCer was not directly related to stimulation of CD1d/α-GalCer-reactive iNKT cells. For example, interaction between OVA protein and micelles formed by the glycolipid might lead to more efficient absorption of Ag by resident APC, perhaps via CD1d molecules. To provide further proof that iNKT cells were required for the α-GalCer-mediated increase in presentation to T cells (including cross-presentation to CD8+ T cells), we examined immune responses to OVA in animals lacking the Jα281 TCR gene segment, and hence iNKT cells (iNKT−/− mice), and in animals lacking CD1d molecules (CD1d−/− mice). In both situations, coadministration of OVA and α-GalCer did not lead to the increased OVA257–264 CD8+ T cells responses seen in the wild-type animals, as assessed with tetramers in the blood (Fig. 3⇓, A and B) and by IFN-γ ELISPOT assays (data not shown). To examine the possibility that the glycolipid itself could enhance Ag uptake, OVA was injected into wild-type animals together with β-GalCer, a glycolipid with similar structure to α-GalCer and shown to be recognized by iNKT cells, but without the capacity to induce their activation (35). Coadministration of β-GalCer and protein did not lead to the dramatically enhanced levels of specific T cell responses that had been observed with α-GalCer. Taken together, these results suggest that the enhanced responses observed with α-GalCer can be directly attributed to the activation of iNKT cells. Enhancement of T cell responses to soluble Ag with injection of αGalCer requires the involvement of iNKT cells. OVA257–264-specific T cell responses were assessed in the blood using H-2Kb/OVA257–264 tetramers in wild-type (C57BL/6) animals and iNKT−/− mice (A) or CD1d−/− mice (B) 7 days after receiving i.v. injection with OVA together with either vehicle or α-GalCer. 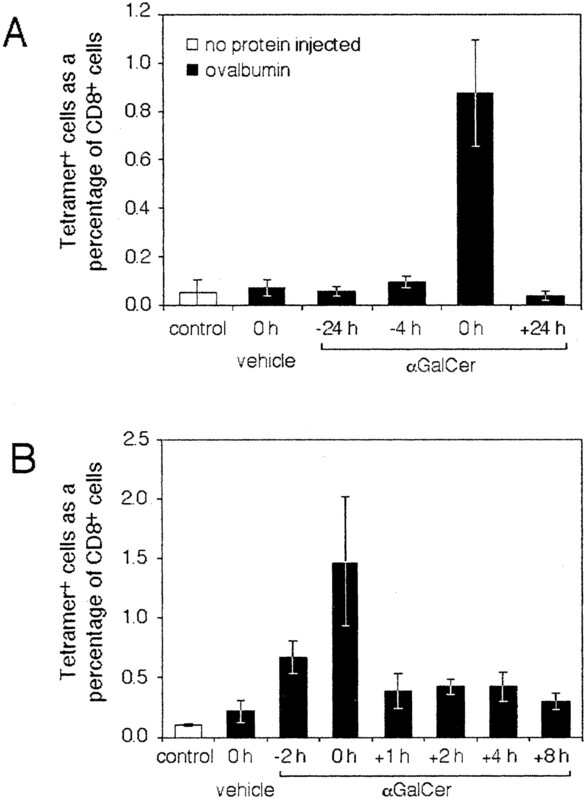 C, OVA257–264-specific T cell responses were likewise assessed in wild-type animals receiving vehicle, α-GalCer, or β-GalCer, a glycolipid known to bind CD1d, but unable to stimulate iNKT cells (35 ). It remained to be established at which time point(s) within the known kinetics of iNKT activation and cytokine induction (36) was the most significant enhancing effect of α-GalCer on immune responses to soluble Ag observed, as this may provide some clues to the mechanism of this effect. In a first screen, responses generated by simultaneous administration of α-GalCer and OVA were compared with those seen when α-GalCer was given 24 h before, 4 h before, and 24 after OVA. This study suggested that the enhancing effect could only be induced when protein and glycolipid were injected simultaneously (Fig. 4⇓A). However, a finer analysis of α-GalCer administration indicated that some enhancement could be observed if α-GalCer was administered 2 h before OVA and to a limited extent up to 8 h after OVA (Fig. 4⇓B). Again, significantly, the most potent enhancement was observed when OVA and α-GalCer were injected at the same time. These data imply that enhancement of T cell responses is dependent upon close temporal association between presentation of OVA-derived peptides and α-GalCer molecules. Injection of α-GalCer enhances T cell responses to soluble protein Ag only if administered in close temporal association with protein. OVA257–264-specific T cell responses were assessed in the blood 7 days after animals received i.v. injection of OVA (time zero = 0 h) and α-GalCer or vehicle injected at the indicated times relative to protein injection. The requirement for close timing of α-GalCer and protein administration to enhance T cell responses could reflect the need for simultaneous uptake of these molecules and perhaps a requirement for colocalization of their antigenic components on the same APC. To look at this possibility in more detail, we examined immune responses to injection of cultured bone marrow-derived DC loaded with glycolipid and peptide Ags in vitro. Loading DC with α-GalCer in vitro did not induce maturation before injection, as determined by expression levels of CD80, CD86, and MHC class II (data not shown). Immune responses to the MHC class I binding peptides LCMV GP34–41 (Fig. 5⇓A) or OVA257–264 (Fig. 5⇓B) were assessed in the blood with MHC class I tetramers 7 days after DC injection. In both experimental models, loading DC with peptide and α-GalCer resulted in reproducible 2- to 3-fold increases in immune responses over those induced with DC and peptide alone (Fig. 5⇓, A and B). In addition, it was found that the α-GalCer-induced increase in immune response occurred only if the peptide and α-GalCer were presented on the same DC, rather than on separate DC (Fig. 5⇓A, first panel). The enhancing effect of simultaneous presentation of peptide and α-GalCer was not seen when DC were injected into iNKT−/− hosts (Fig. 5⇓A, right panel), implying a direct role for the interaction of iNKT with DC. By maturing DC with LPS before injection, it was possible to enhance the immune response to LCMV GP34–41 peptide to levels seen with α-GalCer. However, when α-GalCer was loaded onto DC that had been matured with LPS, no further increases in immune responses were observed (Fig. 5⇓A, lower panel). Together these data suggest that interactions between DC and iNKT cells lead to enhanced DC maturation, and hence an improvement of MHC class I-restricted immune responses. This observation is very similar to the reported function of CD4+ T cell help in the context of CD8+ T cell activation (8, 9, 10). We therefore examined whether addition of a known MHC class II binding peptide could provide such a maturation stimulus to DC, and whether α-GalCer-mediated iNKT stimulation can fully substitute for this CD4+ T cell help. Injection of DC loaded with both MHC class I binding peptide (OVA257–264) and MHC class II binding peptide (OVA323–339) resulted in a larger OVA257–264-specific immune response than injection of DC loaded with the class I binding peptide alone (Fig. 5⇓B), implying provision of CD4+ T cell-mediated help. However, substituting the class II binding peptide with α-GalCer resulted in even more profound helper activity, which could not be improved by loading the DC with class II peptide and α-GalCer together. Thus, iNKT are able to exert a helper function that exceeds the potency of CD4+ T cell-mediated help, presumably due to their increased frequency. Finally, the effect of α-GalCer-mediated iNKT activity was examined in the context of presentation of whole protein. DC were incubated with OVA protein for 24 h before injection, a process that permitted some degree of Ag uptake and processing. Injection of these DC induced a weak OVA257–264-specific response, although the levels seen were statistically insignificant (Fig. 5⇓C). However, if the OVA-loaded DC were also loaded with α-GalCer, a significant immune response was observed. Again, as Ag processing should have provided both MHC class I and class II binding peptides in this experiment, the effect of iNKT cell-mediated help appears to be more potent than that of classical CD4+ T cell-mediated help. DC-induced T cell responses can be enhanced by concomitant, α-GalCer-mediated, activation of iNKT cells capable of substituting for CD4+ T cell help. 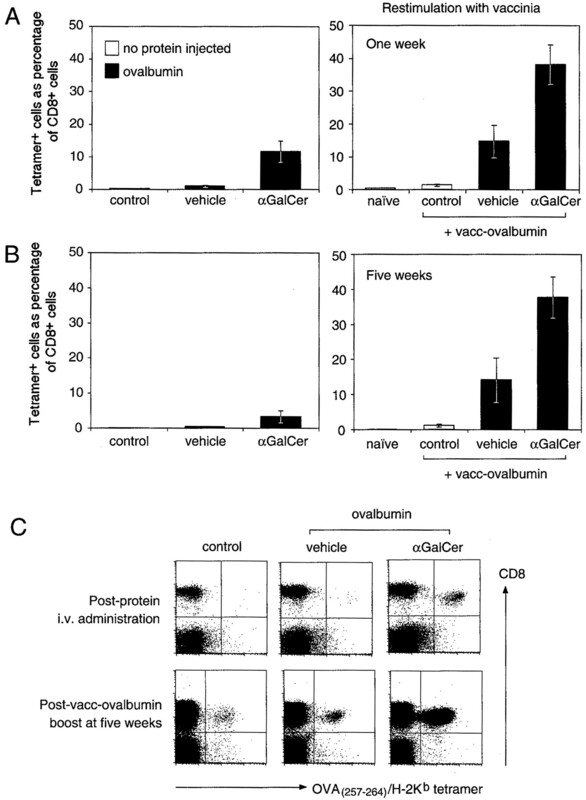 A, LCMV GP34–41-specific CD8+ T cell responses were assessed in the blood 7 d after animals had received DC loaded with LCMV GP34–41 together with α-GalCer, vehicle or PBS, or untreated DC. One group (first panel, αGalCer*) received DC that were loaded with LCMV GP34–41 and α-GalCer separately, and then combined before injection. In some instances, iNKT−/− mice were used as recipients (right panel) and in others the DC were matured with LPS before injection (lower panel). B, OVA257–264-specific responses in animals that received α-GalCer- or vehicle-treated DC loaded with the MHC class I binding peptide OVA257–264 alone or together with the class II binding peptide OVA323–339. Animals injected with DC without peptides served as negative controls. 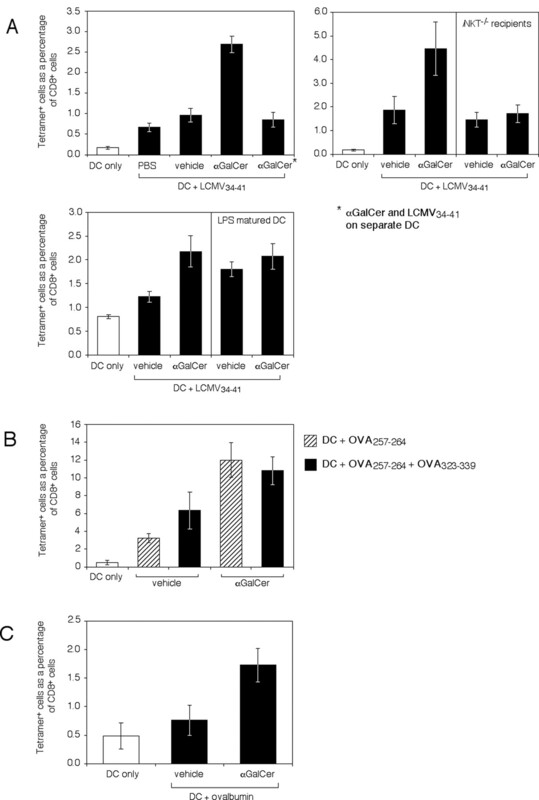 C, OVA257–264-specific responses assessed in animals that received α-GalCer- or vehicle-treated DC exposed to whole OVA in vitro. Animals injected with DC without protein served as negative controls. To further investigate a role for iNKT cell-mediated maturation of DC in vivo, the maturation status of DC taken directly from the spleens of animals injected with α-GalCer was examined. DC were isolated by positive selection using anti-CD11c-coated magnetic beads 24 h after the glycolipid was injected, and then maturation status was established by determining the levels of expression of the costimulatory molecules CD80 and CD86. Representative FACS profiles are shown in Fig. 6⇓. While injection of vehicle had no effect on levels of CD80 and CD86 on DC relative to naive controls, injection of α-GalCer induced up-regulation that was equal to or higher than that induced by injection of LPS, a known maturation signal for DC. These data suggest, therefore, that iNKT cell activation can provide a potent DC maturation stimulus. Injection of α-GalCer leads to maturation of splenic DC. Ab conjugated to magnetic beads was used to isolate CD11c+ cells from the spleens of animals that had received i.v. vehicle, α-GalCer, or LPS 24 h previously. Representative FACS profiles show the expression of CD80 and CD86 on positively sorted CD11c+ cells from treated animals relative to untreated controls (gray). It as been reported that iNKT cells express CD40L upon activation (37) and may therefore induce DC maturation and activation through interaction with CD40 (13, 15). To investigate this possibility, OVA protein was injected into CD40L−/− recipients together with α-GalCer or vehicle. No induction of OVA257–264-specific CD8+ T cell responses was observed in these animals that could be enhanced in response to α-GalCer treatment (Fig. 7⇓A). Analysis of serum cytokine levels (Fig. 7⇓B) in CD40L−/− recipients indicated that iNKT cells could be activated to produce IL-4 in response to α-GalCer, but that, unlike in wild-type recipients, they were unable to produce IFN-γ in the absence of subsequent CD40/CD40L-mediated signals. To assess the possibility that IFN-γ played a key role in iNKT modulation of T cell responses, OVA protein was injected into IFN-γR−/− recipients together with α-GalCer or vehicle (Fig. 7⇓C). The inability to respond to IFN-γ in these animals made no difference to the induction of OVA257–264-specific CD8+ T cell responses and, importantly, did not affect the enhancement of this response by α-GalCer. Similarly, injection of OVA protein together with OCH (Fig. 7⇓D), an analog of α-GalCer that induces activation of iNKT cells with a profile of cytokine release predominated by IL-4, rather than IFN-γ (29), had no effect on iNKT-mediated enhancement of T cell responses to the protein (Fig. 7⇓E). These data suggest, therefore, that the enhancing effect of iNKT cell stimulation on T cell responses does not require IFN-γ, but does require CD40 signaling. The iNKT cell-mediated enhancement of T cell responses to soluble protein requires CD40 signaling and is independent of IFN-γ production. A, OVA257–264-specific T cell responses were assessed in C57BL/6 or CD40L−/− mice that received i.v. injection of OVA together with either vehicle or α-GalCer, with serum cytokine levels in α-GalCer-treated animals (B) determined by ELISA at the indicated times. C, Specific T cell responses were similarly assessed in IFN-γR−/− animals and 129S6/SvEv controls or in C57BL/6 animals injected with OVA and the α-GalCer analog OCH (D). E, Serum cytokine levels were determined for the latter experiment. Finally, we investigated the therapeutic potential of initiating immune responses with soluble Ag and concomitant activation of iNKT cells (Fig. 8⇓). The tumor cell line EG7.OVA, a derivative of the murine thymoma EL4 transfected with chicken OVA cDNA (34), grows progressively when injected s.c. into C57BL/6 mice. When recipients were treated with OVA together with vehicle 11 days before tumor challenge, no notable antitumor response was initiated, and tumor engraftment and progression were observed. This was despite a weak, but measurable, OVA257–264-specific CD8+ T cell response in the blood on day 7 post-OVA injection (data not shown). In contrast, when the recipients were treated with OVA together with α-GalCer before tumor challenge, a significant resistance to tumor progression was initiated, with the majority of animals remaining tumor free >40 days after tumor challenge. This experiment highlights the potential for immunotherapeutic strategies based upon the knowledge that iNKT stimulation can significantly potentiate T cell responses to soluble Ag. Activation of NKT cells enhances T cell responses to tumor-specific Ag. Progression of EG.7OVA tumors implanted s.c. was monitored in animals that had been treated with i.v. OVA protein together with vehicle (•) or α-GalCer (♦) 8 d previously or in untreated animals (○). The mean tumor sizes per group ± SEM are shown. Signals received by immature DC as they transit from peripheral sites to the draining lymph nodes may ultimately dictate the nature of adaptive responses. In this report we show that iNKT cells responding to glycolipids presented by monomorphic CD1d molecules can significantly enhance T cell responses to soluble Ag in vivo. This modulation is accomplished through direct interaction with DC, with iNKT cells presumably providing an early source of CD40L signals required for Th1-biased responses, and CTL induction. Activation of iNKT cells by administration of α-GalCer together with i.v. delivery of soluble OVA protein results in considerable enhancement of OVA-specific T cell responses, including CTL responses reliant upon cross-presentation (Fig. 1⇑). Analysis of splenic DC isolated from animals injected with α-GalCer indicated that iNKT activation induces up-regulated expression of costimulatory molecules, reflecting a more mature DC status (Fig. 6⇑). Thus, appropriately timed administration of protein relative to α-GalCer allowed processed protein to be presented on DC with enhanced stimulatory function. A cognate interaction between iNKT cells and DC was critical to the enhancement of T cell responses observed, as the potentiating effect of α-GalCer on injection of peptide-loaded BM-derived DC occurred only when the glycolipid was presented on the same DC as the peptide (Fig. 5⇑). These experiments were undertaken with DC that had been loaded with a minimal MHC class I binding peptide, rather than whole protein, so that CD8+ T cell responses could be interpreted without any potentially confounding effects of iNKT cells on protein processing and presentation. While these results suggest that enhancement of the stimulatory capacity of DC is one of the key outcomes of iNKT interaction, the possibility that processing and presentation of whole protein can also be modified needs further investigation. The effect of iNKT interaction on DC function proved to be a more powerful stimulus to CD8+ T cell responses than induction of conventional CD4+ T cell help provided by loading both MHC class I and II binding peptides onto the injected DC (Fig. 5⇑). This is presumably due to the greater number of iNKT cells in the lymphoid tissues relative to naive Ag-specific CD4+ T cells, and hence an improved probability of interacting with injected DC. DC matured with LPS before injection also enhanced the peptide-specific CD8+ T cell responses over those induced with nonmatured DC, although this enhancement could not be improved with iNKT stimulation using α-GalCer (Fig. 5⇑). While this would suggest that iNKT cells act in a similar fashion to LPS, namely to mature the DC, it is also possible that the LPS stimulus has saturated the potentiation of the DC so that they can no longer respond further to iNKT cell-mediated signals. Efficient cross-priming of CD8+ T cells requires uptake of Ag by immature DC together with exposure to effective maturation stimuli. The most important stimuli in this regard are thought to be CD40L signals, generally presumed to come from CD4+ Th cells (8, 9, 10). Schulz et al. (38) have reported that effective CD40 triggering of DC, as measured by IL-12 induction, requires initial microbial priming of the DC. In our system, where i.v. injection of soluble OVA alone induced cross-priming, it is most likely that low levels of endotoxin in the commercial source of OVA used were providing such a microbial signal. This signal could then combine with conventional CD4+ T cell-mediated help to induce priming of CD8+ responses. The fact that all cross-priming was abrogated in CD40L−/− animals highlights the importance of integrating microbial and CD40-mediated signals in this system (Fig. 7⇑). Importantly, while functional CTL with restimulatory capacity could be induced with OVA alone, a dramatic increase in the quantity of CTL (5–10 times) was observed when iNKT were concomitantly activated with α-GalCer, most likely reflecting a greater supply of CD40L signals from stimulated iNKT cells. 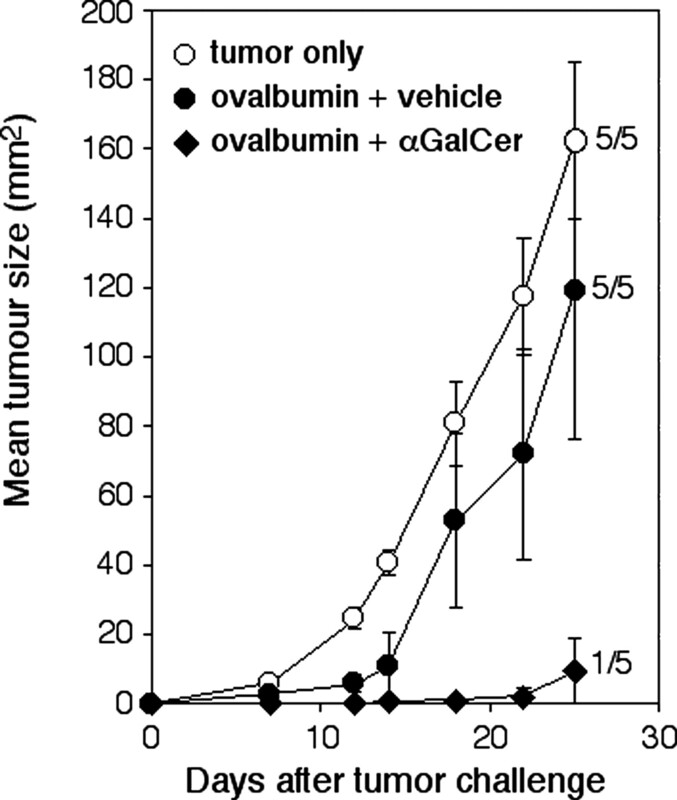 Furthermore, only CTL induced in the presence of α-GalCer provided resistance to challenge with OVA+ tumors (Fig. 8⇑). Although we have not ruled out the possibility that CD40L-dependent maturation of DC is due to other CD40L+ cells, it is most likely that high numbers of activated iNKT cells can provide an effective CD40L-mediated boost to an otherwise weakly cross-presented CTL response. It is likely that a number of reciprocal exchanges between iNKT cell and DC will ultimately determine the quality of an adaptive response. Initial engagement between iNKT and APC bearing a glycolipid ligand leads to release of a burst of IL-4 by iNKT cells, which can be achieved in the absence of CD40 signaling (39) (Fig. 7⇑). This initial engagement may then lead to increased expression of CD40L on the iNKT cell surface and subsequent interaction with DC expressing CD40. As a consequence, DC will be induced to release IL-12, which, in turn, stimulates iNKT cells to release IFN-γ. It has been suggested that IFN-γ produced by iNKT cells can induce up-regulation of IL-12 receptors on iNKT cells in an autocrine manner (13). These cells therefore become more sensitive to IL-12, resulting in further IFN-γ production. Other studies have highlighted the events subsequent to this point, namely activation of NK cells and release of further IFN-γ (40). Here we highlight a second outcome of this interaction in which the CD40-mediated activation of DC leads to a greatly enhanced capacity to stimulate naive T cells reactive to foreign Ag. If this cycle of events is blocked as a result of inability to stimulate through CD40, iNKT cells can still respond to α-GalCer by producing IL-4 (Fig. 7⇑B), but the activation of DC cannot take place. On the other hand, the induction of IFN-γ, an event that occurs subsequent to CD40 signaling, is not crucial to the enhancement of T cell responses to soluble Ag (Fig. 7⇑). These data imply that it is the cognate interaction between iNKT cells and DC that is dictating enhancement of T cell responses to soluble Ag, and not a potentiating effect of IFN-γ on DC function, as was reported when α-GalCer was used to enhance responses to antimalaria vaccines (41). Animal studies have highlighted the utility of α-GalCer in the induction of antitumor responses (42). This activity is thought to arise through iNKT cell-mediated activation of NK cells and rapid induction of IFN-γ (43), with the antiangiogenic property of IFN-γ playing a key role (44). It has been reported that some antitumor CTL activity may also be invoked through iNKT activation with α-GalCer (45, 46). Our results would suggest that this activity would be dependent upon iNKT-mediated activation of DC that have acquired unique tumor Ags. While this may occur to a limited degree in tumor-bearing hosts treated with α-GalCer alone, a more successful antitumor response would be induced if concomitant presentation of tumor Ag and α-GalCer was coordinated by injection of unique tumor proteins with the glycolipid. In our studies resistance to challenge with OVA+ tumors was induced in such a fashion (Fig. 8⇑). Therapy of this type could potentially be used in all cancer patients, regardless of MHC haplotype, as the adjuvant capacity of iNKT cells is dependent upon presentation of α-GalCer by monomorphic CD1d molecules. Care must be taken, however, with the use of multiple rounds of therapy, as animals studies suggest that repeated α-GalCer administration can lead to a Th2 bias in cytokine profile (47, 48). Our results are in concordance with previous reports showing modulation of DC activity by cells restricted by monomorphic nonclassical MHC class I-like molecules (15, 16). In addition, DNA microarray analysis of human iNKT activated with anti-CD3 Abs has been reported to show cytokine and chemokine expression profiles consistent with the recruitment and maturation of DC (49). Thus, cross-talk between cells restricted by nonclassical MHC class I-like molecules and DC, coordinated by TCR engagement with potentially stress-induced glycolipid ligands, may be significantly involved in controlling conventional, DC-induced T cell responses. Shin-ichiro et al. (50) recently published similar evidence that α-GalCer stimulates maturation of DC and enhances CD4+ and CD8+ T cell responses. We thank the personnel of the Biomedical Services Unit of John Radcliffe Hospital for animal husbandry, and Kirin Breweries for providing the α-GalCer. We thank Michael J. Palmowski for helpful discussions. ↵1 This work was supported by a Cancer Research UK (CRUK) program grant (C399/A2291) and the Cancer Research Institute. ↵2 I.F.H. and J.D.S. contributed equally to this paper. 4 Abbreviations used in this paper : DC, dendritic cell; CD40L, CD40 ligand; CM, complete medium; GalCer, galactosylceramide; iNKT cells, invariant NKT cell; LCMV, lymphocytic choriomeningitis virus. Belz, G. T., W. R. Heath, F. R. Carbone. 2002. The role of dendritic cell subsets in selection between tolerance and immunity. Immunol. Cell. Biol. 80:463. Anderson, D. M., E. Maraskovsky, W. L. Billingsley, W. C. Dougall, M. E. Tometsko, E. R. Roux, M. C. Teepe, R. F. DuBose, D. Cosman, L. Galibert. 1997. A homologue of the TNF receptor and its ligand enhance T-cell growth and dendritic-cell function. Nature 390:175. Rescigno, M., V. Piguet, B. Valzasina, S. Lens, R. Zubler, L. French, V. Kindler, J. Tschopp, P. Ricciardi-Castagnoli. 2000. Fas engagement induces the maturation of dendritic cells (DCs), the release of interleukin (IL)-1β, and the production of interferon-γ in the absence of IL-12 during DC-T cell cognate interaction: a new role for Fas ligand in inflammatory responses. J. Exp. Med. 192:1661. Bennett, S. R., F. R. Carbone, F. Karamalis, R. A. Flavell, J. F. Miller, W. R. Heath. 1998. Help for cytotoxic-T-cell responses is mediated by CD40 signalling. Nature 393:478. Lantz, O., A. Bendelac. 1994. An invariant T cell receptor α chain is used by a unique subset of major histocompatibility complex class I-specific CD4+ and CD4−8− T cells in mice and humans. J. Exp. Med. 180:1097. MacDonald, H. R.. 1995. NK1.1+ T cell receptor−α/β+ cells: new clues to their origin, specificity, and function. J. Exp. Med. 182:633. Stober, D., I. Jomantaite, R. Schirmbeck, J. Reimann. 2003. NKT cells provide help for dendritic cell-dependent priming of MHC class I-restricted CD8+ T cells in vivo. J. Immunol. 170:2540. Vincent, M. S., D. S. Leslie, J. E. Gumperz, X. Xiong, E. P. Grant, M. B. Brenner. 2002. CD1-dependent dendritic cell instruction. Nat. Immunol. 3:1163. Leslie, D. S., M. S. Vincent, F. M. Spada, H. Das, M. Sugita, C. T. Morita, M. B. Brenner. 2002. CD1-mediated γ/δ T cell maturation of dendritic cells. J. Exp. Med. 196:1575. Braciale, T. J., L. A. Morrison, M. T. Sweetser, J. Sambrook, M. J. Gething, V. L. Braciale. 1987. Antigen presentation pathways to class I and class II MHC-restricted T lymphocytes. Immunol. Rev. 98:95. Monaco, J. J.. 1995. Pathways for the processing and presentation of antigens to T cells. J. Leukocyte Biol. 57:543. Bevan, M. J.. 1976. Cross-priming for a secondary cytotoxic response to minor H antigens with H-2 congenic cells which do not cross-react in the cytotoxic assay. J. Exp. Med. 143:1283. Carbone, F. R., M. J. Bevan. 1990. Class I-restricted processing and presentation of exogenous cell-associated antigen in vivo. J. Exp. Med. 171:377. Rock, K. L., S. Gamble, L. Rothstein. 1990. Presentation of exogenous antigen with class I major histocompatibility complex molecules. Science 249:918. Albert, M. L., M. Jegathesan, R. B. Darnell. 2001. 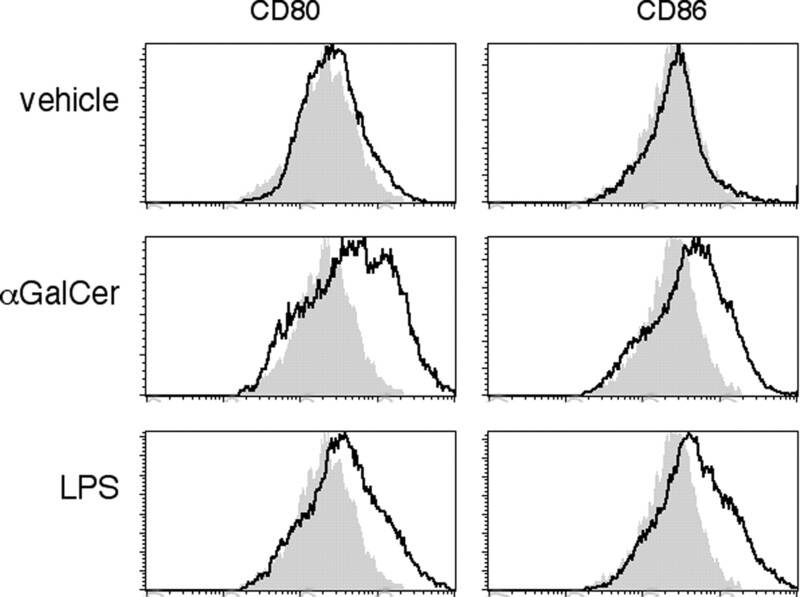 Dendritic cell maturation is required for the cross-tolerization of CD8+ T cells. Nat. Immunol. 2:1010. Huang, S., W. Hendriks, A. Althage, S. Hemmi, H. Bluethmann, R. Kamijo, J. Vilcek, R. M. Zinkernagel, M. Aguet. 1993. Immune response in mice that lack the interferon-γ receptor. Science 259:1742. Figueroa-Perez, S., R. R. Schmidt. 2000. Total synthesis of α-galactosyl cerebroside. Carbohydr. Res. 328:95. Restifo, N. P., I. Bacik, K. R. Irvine, J. W. Yewdell, B. J. McCabe, R. W. Anderson, L. C. Eisenlohr, S. A. Rosenberg, J. R. Bennink. 1995. Antigen processing in vivo and the elicitation of primary CTL responses. J. Immunol. 154:4414. Whelan, J. A., P. R. Dunbar, D. A. Price, M. A. Purbhoo, F. Lechner, G. S. Ogg, G. Griffiths, R. E. Phillips, V. Cerundolo, A. K. Sewell. 1999. Specificity of CTL interactions with peptide-MHC class I tetrameric complexes is temperature dependent. J. Immunol. 163:4342. Palmowski, M. J., E. M. Choi, I. F. Hermans, S. C. Gilbert, J. L. Chen, U. Gileadi, M. Salio, A. Van Pel, S. Man, E. Bonin, et al 2002. Competition between CTL narrows the immune response induced by prime-boost vaccination protocols. J. Immunol. 168:4391. Moore, M. W., F. R. Carbone, M. J. Bevan. 1988. Introduction of soluble protein into the class I pathway of antigen processing and presentation. Cell 54:777. Karadimitris, A., S. Gadola, M. Altamirano, D. Brown, A. Woolfson, P. Klenerman, J. L. Chen, Y. Koezuka, I. A. Roberts, D. A. Price, et al 2001. Human CD1d-glycolipid tetramers generated by in vitro oxidative refolding chromatography. Proc. Natl. Acad. Sci. USA 98:3294. Tomura, M., W. G. Yu, H. J. Ahn, M. Yamashita, Y. F. Yang, S. Ono, T. Hamaoka, T. Kawano, M. Taniguchi, Y. Koezuka, et al 1999. A novel function of Vα14+CD4+NKT cells: stimulation of IL-12 production by antigen-presenting cells in the innate immune system. J. Immunol. 163:93. Hayakawa, Y., K. Takeda, H. Yagita, L. Van Kaer, I. Saiki, K. Okumura. 2001. Differential regulation of Th1 and Th2 functions of NKT cells by CD28 and CD40 costimulatory pathways. J. Immunol. 166:6012. Gonzalez-Aseguinolaza, G., L. Van Kaer, C. C. Bergmann, J. M. Wilson, J. Schmieg, M. Kronenberg, T. Nakayama, M. Taniguchi, Y. Koezuka, M. Tsuji. 2002. Natural killer T cell ligand α-galactosylceramide enhances protective immunity induced by malaria vaccines. J. Exp. Med. 195:617. Kawano, T., J. Cui, Y. Koezuka, I. Toura, Y. Kaneko, H. Sato, E. Kondo, M. Harada, H. Koseki, T. Nakayama, et al 1998. Natural killer-like nonspecific tumor cell lysis mediated by specific ligand-activated Vα14 NKT cells. Proc. Natl. Acad. Sci. USA 95:5690. Hayakawa, Y., K. Takeda, H. Yagita, M. J. Smyth, L. Van Kaer, K. Okumura, I. Saiki. 2002. IFN-γ-mediated inhibition of tumor angiogenesis by natural killer T-cell ligand, α-galactosylceramide. Blood 100:1728. Nishimura, T., H. Kitamura, K. Iwakabe, T. Yahata, A. Ohta, M. Sato, K. Takeda, K. Okumura, L. Van Kaer, T. Kawano, et al 2000. The interface between innate and acquired immunity: glycolipid antigen presentation by CD1d-expressing dendritic cells to NKT cells induces the differentiation of antigen-specific cytotoxic T lymphocytes. Int. Immunol. 12:987. Singh, N., S. Hong, D. C. Scherer, I. Serizawa, N. Burdin, M. Kronenberg, Y. Koezuka, L. Van Kaer. 1999. Cutting edge: activation of NK T cells by CD1d and α-galactosylceramide directs conventional T cells to the acquisition of a Th2 phenotype. J. Immunol. 163:2373. Wilson, S. B., M. C. Byrne. 2001. Gene expression in NKT cells: defining a functionally distinct CD1d-restricted T cell subset. Curr. Opin. Immunol. 13:555. Shin-ichiro, F., K. Shimizu, C. Smith, L. Bonifaz, R. M. Steinman. 2003. 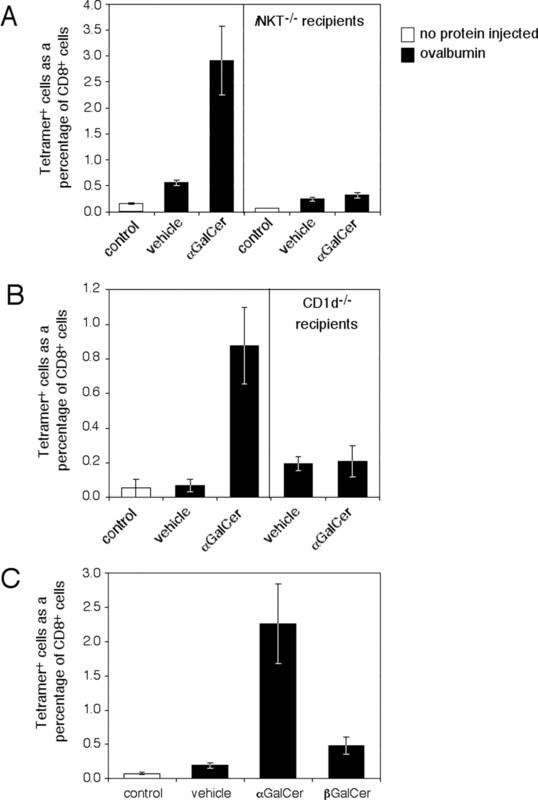 Activation of natural killer T cells by α-galactosylceramide rapidly induces full maturation of dendritic cells in vivo and thereby acts as an adjuvant for combined CD4 and CD8 T cell immunity to a coadministered protein. J. Exp. Med. 198:267.